Do puzzles help those with Alzheimer’s and dementia? "It all depends upon the puzzle." There are many important factors to consider when deciding if a puzzle is beneficial for those with Alzheimers or dementia. I feel until you have spent time with Alzheimer and dementia patients, you don’t realize how important small details are, the ones we take for granted. My mother was always working on large puzzles and didn’t have any problems picking up those tiny, thin cardboard pieces and finding the right place to put them. She could move around and stretch across the cardboard table to fetch any piece she wanted. But, after her stroke and being paralyzed on her right side, things were different. She could not move at all on her right side and couldn’t lean across the table to pick up a puzzle piece. She was a little shaky doing things with her left hand and unable to voice how she felt made it more frustrating. My father was her caregiver and I remember like it was yesterday, dad bringing home a small childs puzzle with baby chick theme. Mom didn’t put it together, she just cried. Later we discovered she was embarrassed and felt humiliated because it was a child’s puzzle and she was not a child. Her disabilities made it difficult to find activities she could do without becoming frustrated. Her frustrations were embedded in my memory and her needs became my model for memory jogging puzzles and memory exercise card games. One size puzzle does NOT meet everyone’s needs. There are several large piece puzzles on the market. I have heard, some of these puzzle pieces are too large, making it difficult for elderly to handle. And, the completed puzzle is too big, making it difficult for people to find, reach and put in place puzzle pieces. If your loved one has disabilities, the best puzzle size is one that keeps puzzle and puzzle pieces visible and within reach. Large chunky pieces are great for those with arthritis, shaky or large hands, giving them substance to feel and hang on to. Puzzles that are beneficial do not frustrate the individual. Puzzles with too many pieces are frustrating to elderly, seniors with dementia and Alzheimer’s patients. 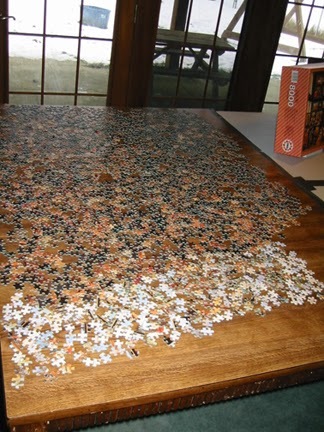 If the puzzle has too many pieces, most likely it will not be completed during activity time. Many think this isn’t a problem, I’ve observed this scene and it is a problem. Especially when there are different levels of individuals putting the puzzle together. In order to have a good feeling of accomplishment the puzzle should be completed. Many times individuals are brought up to the tables in a wheelchair to work on large puzzles. They have limitations; this is not a fun activity. They are given a few pieces to work with, 99% of the time their pieces don’t fit any other piece near them. They sit there, knowing they should find the spot where the pieces go and they can’t. They get frustrated and want to leave. This is frustrating to me. It is best if you can work one-on-one. You must choose a puzzle you feel the individual can complete. It is better to have a puzzle with fewer pieces; one they can complete, rather than one more difficult; they can’t do and become frustrated. Yes, you should help them occasionally, but if you are doing the entire puzzle, you are getting the brain exercise not them. You need a puzzle with fewer pieces even then you may need to assist them. Some websites offer only 12 piece puzzles, I’m sorry but a 12 piece puzzle is too difficult for those in the middle stages of dementia. Some even struggle with a 6 piece. For many seniors with dementia it has been a long time since they have put a puzzle together. Be patient with them, assist them if needed and most will recall what they are supposed to do and enjoy the moment. When looking for a puzzle for your loved one, ask yourself if the puzzle meets these needs. • Is the puzzle age appropriate? This will help your loved one keep their dignity. • Will the theme capture their attention? It has to capture their attention to motivate them to participate in putting the puzzle together. • Is the puzzle too large with many small pieces? If so you may want to choose another one. Large puzzles with many pieces, most likely will be frustrating and the person will give up trying. You may see tears rather than a smile. • Are the pieces large and easy to hang on to? If puzzle pieces are too small or too thin, those with arthritis, shaky or large hands may have difficulty picking the pieces up. • Does the puzzle have storytelling theme or is it an object? Storytelling themes stimulate memories, emotions and conversations better than objects. • Is puzzle small with few pieces? Completion builds self-esteem, confidence and stimulates a good feeling of success. Choose a puzzle you feel the individual will enjoy putting together easily without frustration.